This scarf is the first project in the Affirmation collection, to be released over the coming months. 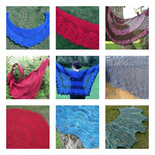 The full collection includes this scarf, a pair of socks, a hat, a shawlette, and a circular shawl, all of which use original stitch patterns derived from positive words. The scarf measures 58½” (148cm) along the top edge and 6¾” (17cm) deep at the centre after blocking when worked to pattern tension of 19 sts and 46 rows to 4”/10cm of garter stitch. Tension for Achieved pattern is best measured over one blocked pattern repeat which should measure 4”/10cm across and 1¼”/3cm high. Exact tension is not vital but it may affect your yardage requirement and finished scarf size. 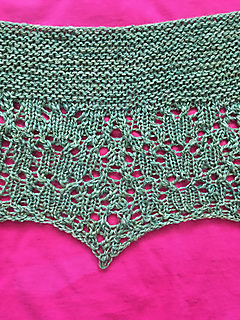 You need to be able to: work lace from either charted or written instructions, work short rows, work a stretchy cast-on (a link is given to a suggested tutorial in the pattern). Both charted and written instructions are given in the pattern. It is NOT necessary to read charts to work this pattern.